Recently, I sat down in a consultation with a woman who was concerned about the status of her Chapter 13 bankruptcy in connection with a pending divorce. She wasn’t even sure how to ask the question, but after a bit of discussion we decided that what she really wanted to know was how do you get divorced when you are already in a Chapter 13 repayment plan? In her particular situation, she had been trying to get a divorce for over three years. Throughout the three years of back and forth negotiations, both attorneys were aware of the Chapter 13 bankruptcy. Yet years in to the process, both attorneys involved decided that they can’t proceed with the divorce due to the bankruptcy. She feels mistreated because both she and her soon to be ex husband have already paid thousands in legal fees at this point and they have been advised that the legal work for which they hired the attorneys will not be completed. She feels it is unethical and unprofessional and really hopes that there is some way for the divorce to proceed alongside the Chapter 13 bankruptcy. Really, this client has two questions, first she wants to know if it’s possible to file for divorce while in Chapter 13 bankruptcy and, second, she wants to know if what her former bankruptcy attorney did was legal. 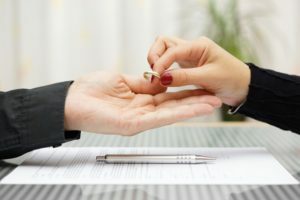 The short answer is that you can file for divorce while you are in Chapter 13 bankruptcy and that whether or not the bankruptcy attorney’s actions were legal would depend entirely on the information they had to work with and what services they agreed to provide in exchange for the money they received. This is one of the reasons why it’s so important to be very clear about what legal services cost. If you are being asked to provide payment for legal services and you aren’t sure what the payment will “cover,” always ask. And whenever possible, get the description of services in writing so that you are both on the same page about what is happening and when, or if, additional payment will become necessary. Now back to the divorce during Chapter 13 bankruptcy question…the bankruptcy court is not going to force anyone to stay married that does not want to be married any longer. Yet there are additional difficulties in this type of situation. You and your spouse are going to have to decide who will pay into the Plan/how the money will be divided. If the Chapter 13 case covers joint debts, there’s a good chance you’ll both pay towards the Chapter 13 Plan, but if the debts are one-sided, it could add friction to your divorce proceedings. If the Chapter 13 repayment plan cannot be completed due to the pending divorce, it’s possible to obtain a modification of your Chapter 13 payments as a result of the changes to income and expenses that divorce can cause. When considering a Chapter 13 payment modification, make sure to review all the related information in detail with your attorney and your spouse so you can be sure that the “new” Plan payments would be sufficient to pay back the debts as required under the Chapter 13 bankruptcy. Property divisions can be trickier when going through a divorce and a Chapter 13 bankruptcy because you aren’t allowed to transfer property without court permission. If a property settlement is to be included in the divorce proceedings you could need permission from the bankruptcy court first. If you have additional questions regarding how your divorce could affect your Chapter 13 bankruptcy or if you simply want to file for Chapter 13 bankruptcy, get in touch with one of the experienced southern California bankruptcy attorneys at Westgate Law.